I remember when the pens won the cup back when I was 3 and 4. 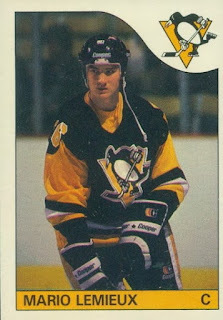 Mario Lemieux was the greatest player to ever step on the ice. I do not think there is any debate. Lemieux did not have the supporting cast that Gretzky did. What if Lemieux was never injured. All you Gretzky fanatics can yell until you are blue in the face. Mario Lemieux was the perfect Hockey Player. The Perfect Specimen. He had size and the best Hockey smart to ever play the game. Give the man his due. Add up the points per game he had. Better then anybody else including Mr. Gretzky. Take all the games he missed and add those points too. We were cheated of fully seeing the All-Time Greatest hockey Player. What this man did in a few short years was amazing. Mario Lemieux is and always will be the Greatest. Period. End of story. Even though I am a wayne gretzky fan i have the most utter respect for "super" mario lemieux beause without a dought i believe had mario stayed healty and played all the games that he was suppose to he would have shattered wayne gretzky's records. I agree with the other bloggers.. Mario would have broke all of Gretzky's records if not for his health problems! He was awesome and I never saw a man his size with such grace, agility and skill!.. Truly amazing and a great person too, and a credit to hockey. "Super Mario" fits PERFECT! 99 has the records, but 66 was the better player. mario's 13 shorthanded goals in a season shows that he was a monster individually as well. thats just insane. he was pound for pound the better player. and he didnt get to play too much in the short goalie pad era as 99 did. I'm a Penguins fan, but I can't rank him above Gretzky. Not voting Gretzky No. 1 (which both Penguins and Bruins fans foolishly do--I haven't seen Red Wings fans do this too much) is like trying to argue that Babe Ruth isn't the greatest baseball player or Michael Jordan isn't the greatest basketball player. It just makes you look ridiculous. Lemieux and especially Orr (who basically had six great seasons, and that's it--Lemieux had 10, and Gretzky had 15) just didn't have the longevity to truly challenge Gretzky for the title of the best player ever. Unfortunately for both Lemieux and Orr they were plagued by injuries that really limit a hockey player's stride and moves. That being said, Gretzky was the greatest due to his incredible skills, scoring touch, and longevity and absolute humility and ability to be the face of Hockey for over 20 years. Let's also not forget that Bobby Orr and Gordie Howe for that matter played in a much tougher era without the advancements in sports medicine that we see today. Howe played against only 5 other teams for the bulk of his career which led to much more stacked teams. As the league grew the talent pool gradually diluted. Orr suffered terrible knee injuries yet played thru them as best as he could for 9 seasons. And was without a doubt the most dominant player any of his peers had ever seen. One must acknowledge that Lemieux is the most physically gifted, and naturally talented and could lift a team up on his ailing back and score 2 goals when they were needed most after needing someone to tie his skates before the game due to his herniated disks in his back. However as Gretzky himself famously quoted "you miss 100% of the shots you never take" similarly, you can't affect a game in which you don't play. And Gretzky was able to lace up the skates night in, and night out to amass the staggering totals that he did which is part of being a great player. Sadly we are only left to wonder what kind of totals Mario Lemieux and Bobby Orr would've been able to stack up had they been able to play 1100+ games. Sure Lemieux was great, but he does not have the records to prove that he was the best. Yes he has 13 short handed goals but, he could have just gotten lucky breaks and scored. I having just become a teen have already scored about 2-3 short handed goals. One of which was a 5 on 3 goal in a state tournament. No contest in my eyes. Mario Lemieux was the greatest player to ever laced up. Gretzky did unbelievable things with less than elite skills. He should be commended for that. But, in terms of pure skill and the ability to dominate a game, there was and remains today nobody in Mario's league. Sidney Crosby is a great player but his relatively small stature keeps him from being the standout that Mario was. Take a look again people at the many game highlights and you will draw the same conclusions.